indie.knits: Not forgotten: Stash Appreciation Wednesday! 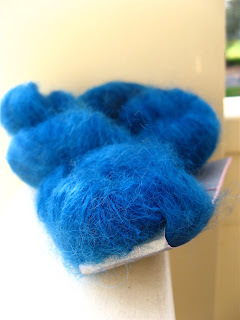 Wednesday is for blue Colinette mohair this week! I got this little skein of Colinette Parisienne in colorway Salty Dog (so cute) at a yarn shop called The Scarlett Skein in San Luis Obispo, California, while on my delightful yarn crawl with my mother. We were on the freeway probably two or three miles out from San Luis when I frantically called the store to ask about directions and parking. When we got there about five minutes later, the lady grinned at us and said, "Did you just call?" As for the yarn, I think it's destined to be a lacy triangular scarflet, nice and kicky. 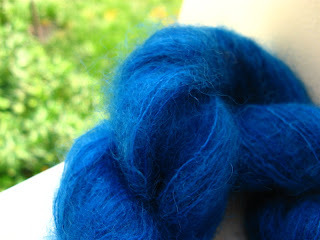 And, is it terrible that I think of this color as Gonzo Blue?